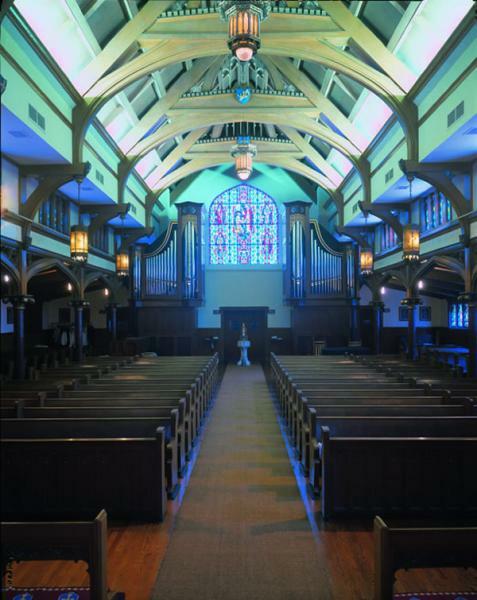 Buzard Organ Opus 35 is a new Choir Accompanying Organ, housed in two mirror-image cases, located at the rear of the Church, framing a large stained glass window and the entry doors. 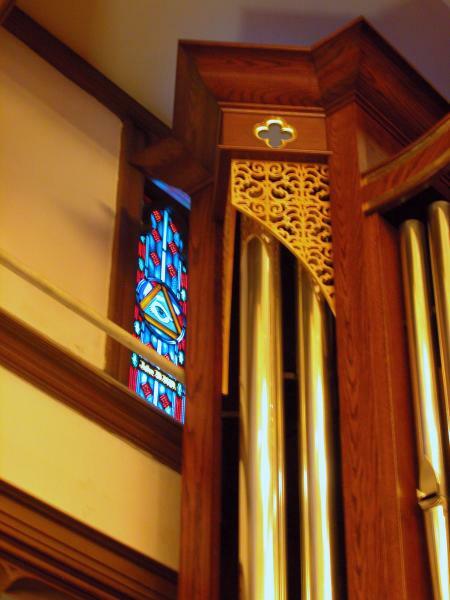 The impetus for installing a portion of the Church’s pipe organ at the Narthex was the expansion of the Parish’s music program, in which the choral singers were moved to the rear of the Church, from their former location in the Chancel. We’ve also planned for eventual installation of horizontally mounted Solo Trumpets immediately under the stained glass window to herald the arrival of dignitaries in procession. 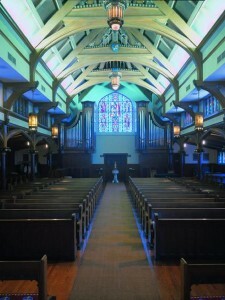 The organ cases have been designed to compliment and respect the Church’s architecture and interior design. The tonal specification has been designed to provide a succinct service-playing and accompanimental organ in our mature Anglican style, as well as compliment the existing McManis Organ in the Chancel, creating an instrument which will be both an integral part of the room and an active participant in the Liturgy. Stops in the McManis Organ marked with an asterisk(*) denote new pipes. The Choir Organ is divided into two sections, one inside each of the cases. Both may be played together, to form a single Choir Organ, playable from the bottom manual keyboard. Additionally, each division of the Choir Organ can be independently coupled to either the Great or Pedal keyboards, and the unison of either shut off, so that one can use the Choir Organ to accompany itself, as though it were a small two manual organ. A lightly voiced 16′ Pedal Gedeckt is located in the Choir Organ’s case, to provide this division with independent pedal sounds. We have also installed an independent 8′ Open Diapason and 4′ Principal in the front and façade of one of the cases of the Choir Organ, but played from the Great manual keyboard. This achieves several goals: The new organ in the back fills the entire Church when leading hymns, leaving the front organ to add color and brightness to the registrations, or to act in an antiphonal capacity; the pipes in the back of the Church, through the use of couplers, could be playable from two keyboards, for musical flexibility; the unenclosed Great Diapason chorus in the back of the Church allows us to voice the enclosed Choir organ’s chorus at a softer volume for accompaniment, so it would not have to serve the competing functions of accompanying versus leading. Both instruments are controlled from a new three manual and pedal English drawknob wing style console. The console’s visual design is consistent with the organ cases and compliments the Church’s architecture and interior design. It is located near the new Choir Organ at the back of the Church. 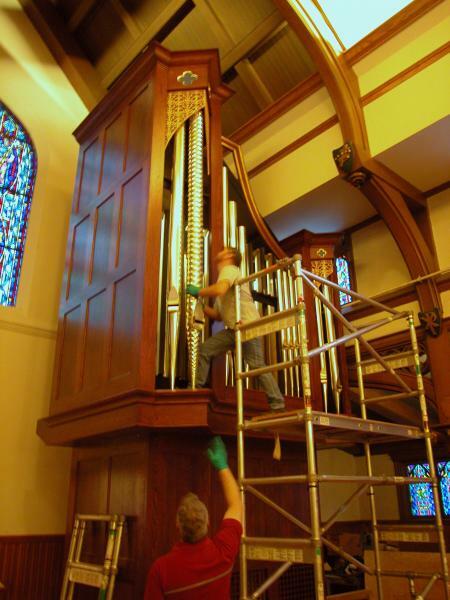 All the pipes above 8′ pitch were brought to the shop for repair, cleaning, and regulation of their voicing. All the zinc basses were replaced with tin/lead metal pipes. The original McManis voicing was respected and restored wherever possible. The two ranks of reed stops were also replaced with new pipes of stout lead and tin pipe metal for darker, fuller, and more consistent tone. We added a full-length Pedal 16′ Trombone, and a full-compass Swell 16′ Fagotto, which was not originally installed. The new reeds are racked in multiple-level European reed traces of steel and felted wood for permanence. 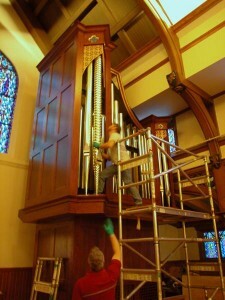 Prior to the re-installation of the McManis pipework, the existing McManis windchests were cleaned to minimize the recurrence of ciphers in the organ. The Tonal Specification has been designed in a style more consistent with the traditional musical requirements of the Anglican Church. 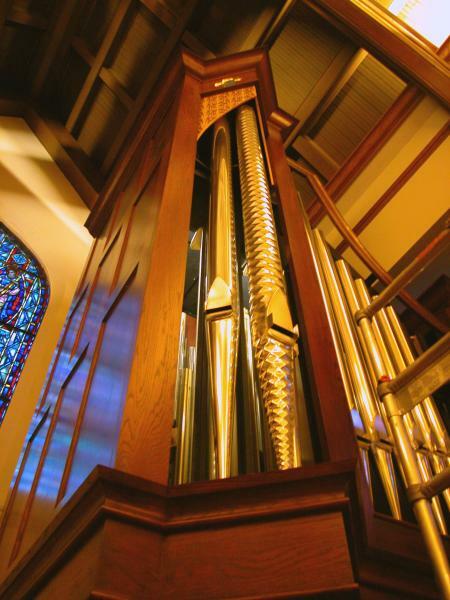 The stop names of the McManis organ have been slightly altered in some instances to more accurately reflect the new tonal context; however, the scaling and overall tonal design of the McManis work was revered and respected. The instrument’s foundation is based upon well-developed Diapason choruses, upon which other coloristic stops have been added to offer greater variety of timbres, for the most thrilling leading of congregational singing, sensitive choral accompaniment, and musical rendering of the entire body of organ literature.